This Page is specially designed for the Aspirants who are preparing for Airports Authority of India’s JE (ATC) Exam. AAI JE(ATC) exam is conducted to recruit Air Traffic Controllers in India for civil airspace management. We keep this page updated with AAI ATC News, Notifications, Updates and Important Links such as AAI ATC Recruitment, Exam Dates, Admit Card, Answer Key, Results and other important stuff. Schedule For Documents Verification And Voice Test (FROM 25th FEBRUARY TO 1st MARCH, 2019) for the post of ATC under Advt. No. 02/2018 . Don’t forget to have a look at the important documents given at the end of the file which are supposed to be presented at the time of verification. The link for downloading the call letters for documents verification will be sent to the shortlisted candidates on their registered E-mail IDs very soon. The final Selection and Appointment will be based on the merit of the candidates in online examination subject to successful completion of documents verification. Admit cards/ Hall Tickets are out for various Junior Executive online examination under the advt. NO. 02/2018. Login Here with Application number and password and click on Hall ticket to download admit card. To check Eligibility Criteria, Selection Process and Pay Scale, Please Download the Official Notification of AAI Recruitment 2018 : 542 Junior Executive Posts . You can start applying online from 28/03/2018. Last Date for Online Applications is 27/04/2018. Application Fee is 300 Rupees. SC/ST/PWD/Female candidates are exempted from payment of fee. Airports Authority of India has released a notification to invite the applications(for the posts of Junior Executive) from eligible candidates having valid Gate-2016 marks. Download Official Notification Here to check if you are eligible or not. Total no. of vacancies are 200. Willing Candidates can register online from 18-09-2017. Willing Candidates need to send acceptance letter latest by 09 June, 2017 to AAI. Joining letters (For the post of JE(ATC) under Advt. No. 07/2015) have been issued through email. Date of Joining is 28th June. Those who could not find their Roll No. in the list, need not to lose heart. As it has become almost a custom for AAI to release second or sometimes even third list. So wait for candidates (first list) to join AAI and if all the candidates do not join then certainly there will be second list. Good luck to all unlucky fellows of first list. Stay tuned for updates. Final Result(Advt. No. 7/2015) is expected by May end. We will update we get any reliable information. They are already asking 2100 candidates to appear in interview for 400 posts. Why do they need to issue second list for interview? There will not be any second list for interviews. Second list is generally declared by any recruiter after completion of interview round. That also when selected candidates in first list do not join the organisation. Interview and Voice Test are expected in April. Keep checking updates on our page. AAI will send email to candidates who have qualified the online exam. Email will include details such as date and time of interview & voice test, documents to be brought while appearing for interview etc. Result of AAI ATC Exam held on 26 April 2016 is expected to be declared in December 2016. AAI recruited 400 ATC Officers through exam conducted on 26 Dec. 2015, who are undergoing training at various Airports and AAI Training Institutes. So it is not feasible to recruit further unless these 400 trainees complete their training. The training of all these candidates is expected to be over by June 2017, so keeping that fact in mind AAI is delaying the result of April’16 ATC Exam. Interviews are expected in February 2017. Stay tuned for more updates. AAI has published Second list of 91 candidates for the post of JE-ATC under recruitment advt. No. 03/2105. Click here for list. Question Papers with keys of Shift 1 & Shift 2 Online Examination held on 24.04.2016 for the post of Jr. Executive (ATC) : Advt. No. 07/2015. We are expecting result to be declared in the month of October 2016. Result of 2016 is likely to be declared late. Possible Reason: Due to mass recruitment in 2015. Result of ATC Recruitment Advt. No. 07/2015 (Exam held on 24 April 2016) is expected by August. Date of joining for JE ATC (Advt No. 03/2015): 25 July 2016. Call letters have been mailed to the selected candidates. As expected by Incomopedia.com, result of Advt. 03/2015 (exam date 26.12.2015) has been declared by AAI. Check the result here: AAI JE-ATC Result Advt. No. 03/2015. Joining by last week of July 2016. AAI is likely to declare the result of JE-ATC Recruitment Advt. No. 2015 (exam held on 26 Dec. 2015, 400 posts) by last week of June and joining is expected by end of July or August first week. AAI has cancelled the recruitment for the post of Manager (Civil/Electrical/Operations), Advt. No. 03/2016, due to administrative reasons. However JE-Finance vacancies are not cancelled which were announced in the same advt. No. Read the notice here. AAI has doubled the number of vacancies for the post of JE (ATC) against the advt no. 07/2015. Now 400 JE-ATC vacancies are to be filled. Read the notice here. Second Phase of Interview: AAI has uploaded another list for additional candidates for the second phase of interview to be held at AAI Corporate Headquarters, Rajiv Gandhi Bhawan, New Delhi from 18 April to 13 May, 2016. Total 1231 candidates have been called for this phase. It will delay the declaration of final result, which can now be expected to be declared by June, 2016. Click here for Second phase of Interview Schedule. Another great step by AAI to present transparency in Recruitment of JE-ATC. AAI has given a link to check the normalised marks of the candidates who appeared in the JE-ATC Exam conducted on 26 Dec. 2015. You need to enter your Application Number & Date of Birth. Check your marks by clicking here. Click here for interview schedule (Advt. No. 03/2015). To everyone’s surprise, AAI has announced the Interview schedule for recruitment against advt no. 03/2015. The possibly reason for expeditious scheduling of interview is due to shortage of ATC Officers in India. All the candidates are required to attend interviews in New Delhi only. (Additional Information: For candidates, not from Delhi, please use Delhi Metro for Interview venue and get down at Jor Bagh Metro Station. Use Exit Gate No. 2 and you will be in from of AAI Headquarters.). All the very best !! As reiterated by INCOMOPEDIA time and again that result will be declared in February, 2016, AAI has declared the result of ATC Exam held on 26.12.2015. Also the expected cut-off marks by us matches with the cut-off decided by AAI. Check result and cut-off marks here. Result of the exam held on 26 Dec. 2015 will be declared in February 2016. First Article of the AAI JE ATC Interview Series that covers General Awareness about Civil Aviation Sector, has been published. Stay tuned and subscribe for the next article. All the candidates who are to write the ATC exam on 26.12.2015 can practice the mock test available at AAI’s website to get familiar with Online test process. 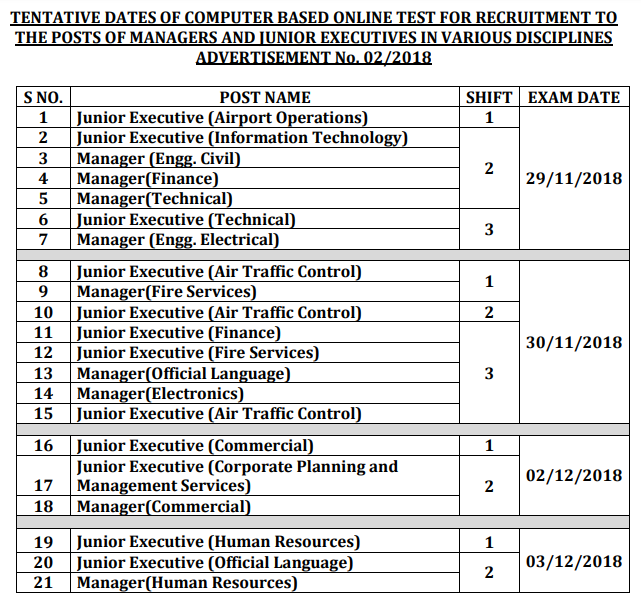 Online test for the post of JE (ATC) (Advt. No. 03/2015) will be conducted on Saturday, 26th December, 2015 in two sessions (Morning/Afternoon). Candidates can download their admit card from 15th Dec. 2015 onward. For details please refer this Link. To overcome the acute shortage of ATC Officers in India, AAI has announced to recruit 200 more ATCOs in the year 2016. Notification (Advt. No. 07/2015) has been published on the website, however dates are yet to be finalized. (Considering the chronic issue of ATCOs’ shortage, Vacancies are likely to be doubled).